Read our analysis on the currency pair EURUSD in this week’s JRC Capital Management Weekly Outlook. Recently, the uncertainty about world economic growth, Brexit and the trade war between the USA and China increased. Draghi, chair of the European Central Bank, in his latest speech, also mentioned those risks. Even though the risk increased, a recession seems very unlikely. Nonetheless, the probability of a rate hike in this year is vanishingly low. The dovish statements by Draghi are not very surprising – the EURUSD still lost in value. However, volatility remained low in recent weeks. Uncertainties for the currency pair remain high on both sides of the Atlantic. Hence, there is no clear direction. The fifth calendar week contains some important economic data. Despite the government shutdown, we also expect some data from the United States. For 34 days now, the US-American government is shut down because the Congress refuses to finance “the wall” at the Mexican border and on the other hand, Trump refuses to sign the proposed budget. The most important data are the trade balance and consumer confidence from the US on Monday, the German consumer price index and the Fed interest rate decision on Wednesday, the euro zone GDP on Thursday and the job market report from the USA on Friday with the Nonfarm Payrolls and the unemployment rate. For a couple of months now, the EURUSD is moving sideways in a narrow range. The low volatility is also visible on the ATR-indicator, which has been moving on a very low level and fell even lower. A short-term downward trend established itself in recent weeks. Currently, the price is at 1.1306. A very important support area where the course bounced of many times in the past. If the price falls below this level, we can locate another support are at 1.1200, the low of the past year. Quotation below this level would be the lowest since June 2017. On the long run, the objective of the bears is to push the price below 1.1000. If the EURUSD remains in its sideways range and moves upwards, the first resistance is located at 1.1400. 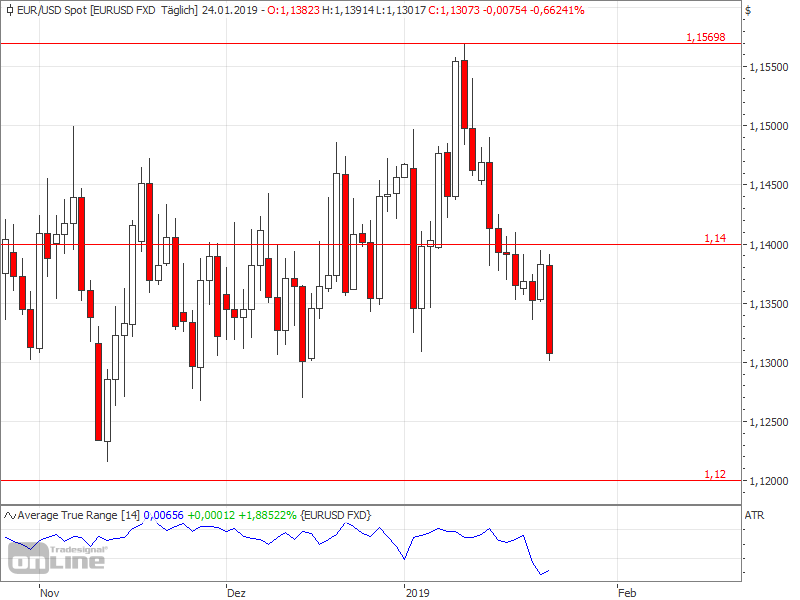 In recent months, the EURUSD oscillated in this area. Subsequently, the high at 1.1569 will be the next resistance.